Olivia is now in her sixties and widowed. She had been disillusioned by her parents when she was young and discouraged by her late husband Jack to follow her dreams. Now when she enters the gazebo that was once a place of romance and intimate moments for Jack and Olivia, she finds it just a place to reminisce about her past life. A mysterious letter not only changes Olivia's thinking, it changes her life in more ways than she could ever imagine. Lazy writing! The only adjective the main character knew was “lovely.” It was choppy and lacked any description. I kept waiting for something to happen, however, in vain. Basically it is a long essay of an woman, telling us some stories from her life. It is as good or as bad as everyone’s else. So, why listen to it? Rather have a chat with your friends instead! Narration didn’t do anything to improve the poor narrative style, if that was even possible. Where does Tea Can Wait rank among all the audiobooks you’ve listened to so far? 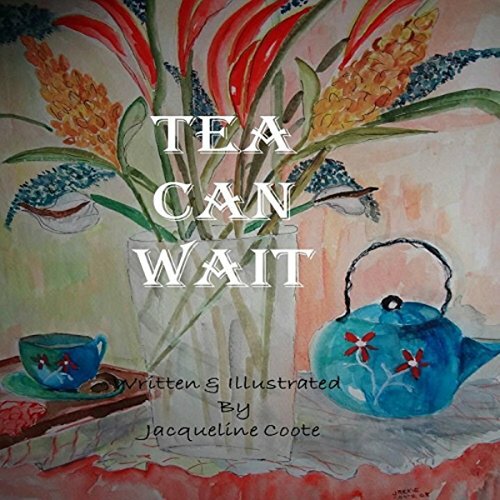 "Tea Can Wait" is my first audiobook. It kept my interest from the beginning to the end. Which character – as performed by Marie Hoffman – was your favorite? My favorite character is Olivia. We were able to see her evolution from one season of life to another one. Who was the most memorable character of Tea Can Wait and why? Jack was the most memorable character. Even though he was deceased, his love for Olivia and compassion for others lived on in one last expression that played out like a well orchestrated symphony. This book was well written and performed. I like how the author, Jacqueline Coote, was able to move from the past to the present with ease and clarity. No questions were left unanswered or mysteries unsolved. This is a well written book. I would recommend this to many friends as the story is wonderfully well written and the narrator did such an amazing job in telling the story. This is a beautiful story of love, loss and life. It really takes you deep into the heart of the characters and makes you feel for them. It is sad in a lot of it, but it is also inspirational and uplifting. Have you listened to any of Marie Hoffman’s other performances before? How does this one compare? This was the first book I have heard from Marie Hoffman. It is hard to pick one because there are so many wonderful characters and a story that ties them all together. This is a beautiful story. I love the narrator because her voice is pleasant and easy to listen to. What made the experience of listening to Tea Can Wait the most enjoyable? Encourage you to follow your dreams no matter what your age. Tells of a widow 60 years old reflecting on how she met her husband, how he fulfilled his dream of being a surgeon. Her job during their marriage and how she had wanted to be a writer. She is given the chance to fulfill her dream in her later years. What about Marie Hoffman’s performance did you like? Enjoy her very much. She changes her tone for different people, very expressive at proper times. I found it very moving when Olivia finds out that her husband had been the doctor taking care of her new bosses wife, working hard to keep her alive. Olivia's husband spoke to the patient's husband about Olivia and her dream to be a writer. I encourage women of all ages to buy either the book or audio, you will not regret it. Jacqueline Coote is a very inspirational writer. I have read this book in the kindle version. Listening to it again on audio is like hearing a whole new book. The narration breathes life into this tale as all audio books do. The voices help us envision the characters & make the story so much more real! This would be a great book to listen to on your way to work or even while you are out for a walk! Good job ladies!